Please find Action OHS Consulting’s May 2013 edition of our 4-monthly newsletter Building a Safe Workplace Together. 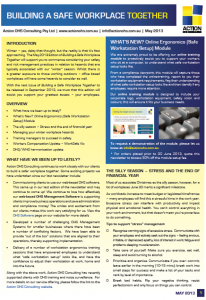 In this edition we provide an overview of our “Safe Workstation Setup Online Module”, whilst delving into what hazards maybe associated with your working environment as a result of winter and reviewing methods to manage workplace stress associated with end of financial year deadlines. In line with our earlier editions of Building a Safe Workplace Together, we have provided an OHS Harmonisation update and a focus on training. Our training focus will support you provide your managers with the skills to implement your health and safety management system.